I love grilled cheese sandwiches. I also love hamburgers. So why did it take me this long to combine the two?! I guess in essence you could call them Patty Melt Sandwiches, but whatever name they're given, they're good. Really good. When I was surfing the web, I came across this article for the 'Web's Greatest Burger Recipes.' This Grilled Cheese Hamburger was one of them and ever since I laid my eyes on it, I couldn't stop thinking about them. I had to make them... and I did. A seasoned beef patty is cooked to perfection before nestling in between two slices of toasted bread adorned with melted American cheese. Heaven. Butter one side of each slice of bread and place the butter sides down on an ungreased baking sheet. Top each slice of bread with a slice of American cheese. Bake in the preheated oven for 7-10 minutes until cheese is melted and bottoms are golden brown. Meanwhile, divide the ground beef into 4 equal pieces. Form each piece into a round burger patty. Season the tops of each burger patty with salt, pepper and Montreal Steak season to your tastes. Heat a skillet over medium high heat. Add the oil and when it starts to shimmer, place the burgers into the pan, seasoned side down. Pan fry the burgers to your desired preference and flip. When the bread is ready, remove from the oven. 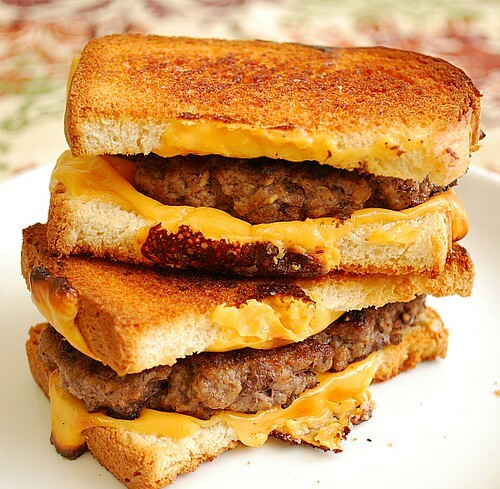 Place a burger patty on top of one slice of cheesy bread. Top with another slice of cheesy bread. Repeat with the remaining burger patties and cheesy bread slices. Slice each burger in half and serve. add some sauteed onion ad rye bread (my family prefers french over rye) and you've got yourself a patti melt....something I had never heard of until I moved to the midwest. Now I can't take it off the menu rotation even if I wanted to. Add some barbeque sauce and you have Boston University's "West Campus Burger"! Isn't this basically a Patty Melt? Anonymous - Pretty much (as I mentioned in my commentary before the recipe) sans caramelized onions. It's best idea. You are add some barbeque sauce. You have any idea about it.